This is Nick's 10th national dealer tour in the UK and kicks off early January with ocassional dates. Nick's one man show, "The Ordinary Man Tour" features brand new material. Short film clips will be screened, including his early 1960's Manchester life, interviews with a man he greatly admired, Robert Dunlop and also the late Martin Finnegan. Triumph and Yamaha examine the impact his ultra-endurance journeys have had on world adventure biking during the last 15 years. Nick will read short excerpts from his autobiographical volumes 1 and 2 as well as showing film clips of his time in the Nubian Desert in Sudan and the Trans African Highway that crosses Ethiopia and Kenya, plus much more. If you are interested in adventure motorcycling, and deeper still, the thinking that goes behind such an intense lifestyle, you cannot miss this performance. Entrance is FREE along with free refreshments. 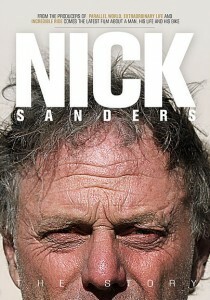 Nick Sanders is best known for his extreme motorcycle journeys. He has ridden around the world 7 times, including 2 record circumnavigations of the globe, the second time in 19 days 4 hours. Having also motorbiked the length of the Americas eight times, he presently holds the record for a double transit from Alaska to Ushuaia and back in 46 days. Yet this “ordinary man in his extraordinary world,” as he describes himself in his two autobiographical volumes, also held the Guinness record for bicycling around the world, which he did in 138 days then a second time in 79 days. He has also cycled to the source of the White Nile, across the Sahara to Timbuktu and the length of South America before taking two narrowboats across the English Channel and along the Danube to the Black Sea and back. Nick has held pilots licenses to fly microlights and hot air balloons. To reserve your places please complete the form below.